These photos were taken Saturday afternoon at Strand Brewing Company’s 8th Anniversary Party. The event featured live music, food by Chefs in Shorts Catering, and 12 Strand Brewing beers on tap. As fate would have it, it was also Strand Brewing Company co-founder Rich Marcello’s 50th birthday, so everyone had even more reason to celebrate. Congratulations to Joel Elliott, Rich Marcello and the entire Strand Brewing Company team on your success; and happy birthday to Rich. Strand Brewing Company is located at 2201 Dominguez Street in Torrance; they are open Tuesday through Sunday, sell cans, bottles and growlers to go and are dog friendly. Cheers! These photos were taken Saturday morning at King Harbor Brewing Company’s Waterfront Tasting Room where they held another in their continuing series of Summer Party Crew 2017 events; this week being their Paddle & Pour (+ Donuts). The morning began with a dozen or so attendees renting stand up paddle boards for an hour out on the water. After they worked up their appetites, everyone headed to the Waterfront Tasting Room for a pairing of King Harbor Brewing Company beers and Blue Star Donuts. Having watched the build-outs of numerous tasting rooms over the last few years, my immediate thought was; “Really? Next month?” I had serious doubts that this could be done that quickly so I headed over today to check it out. I was pleasantly surprised. Apparently, the City of Redondo Beach and King Harbor Brewing Company has been working on this deal since September of last year. 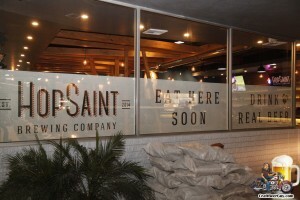 Redondo Beach owns the property and they approached King Harbor Brewing with the idea of them opening a satellite tasting room on the International Boardwalk. The location needed a lot of work but the city was eager to get King Harbor in there and within a few months it had been cleaned up enough for King Harbor Brewing to enter a three year lease with them.